Ghana’s Black Satellites head coach, Mas-Ud Didi Dramani, has defended substituting Yaw Yeboah for Evans Mensah in Ghana’s 1-0 win over Senegal, resulting in 2-3 aggregate loss, last Friday, insisting he had to save the player. 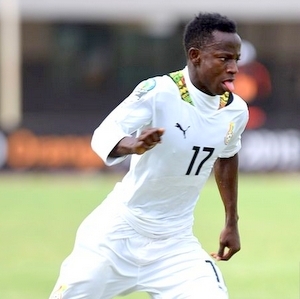 Yaw Yeboah was substituted in the early minutes of the second half to the dissatisfaction of most of the fans at the Cape Coast Sports Stadium, but Didi says that he had to save the player, as the Senegalese were too physical on him. “The Senegalese were also too physical in the game and if you have a player who cannot face such level of physical challenge, you don’t let the player get exposed before you substitute him. “So we had to save him because if you have a player who is not protected by the supervisor of the game, you have to quickly save him,” Didi added. Ghana won by a lone goal but succumbed to Senegal on a 3-2 aggregate to miss out on the 2017 African Youth Championship scheduled to be hosted by Zambia.